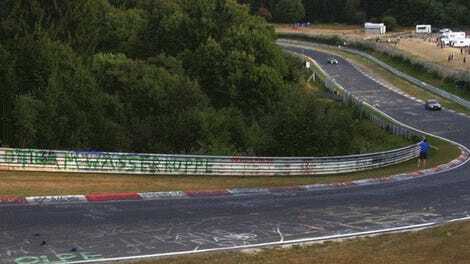 The Nürburgring Nordschelife has close walls and no mercy. Tourist drives on the famed track are taken at your own risk, and that risk is “you might end up with a crumpled wad of metal after this!” This may be the world’s luckiest BMW owner after his car doesn’t become a giant green pinball after losing it on track. Say it with me now: NOT THE WAGON! NOOOOOOOOOOOOO! The BMW driver, who may or may not have a brown driver’s seat now, lost control of his tail-happy wagon, spun around several times and almost got collected by a silver Honda. But most importantly, they didn’t get hit or eat wall. Phew.